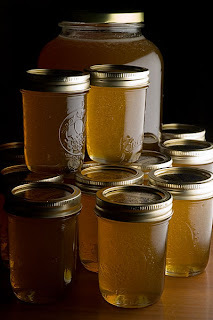 I have some interesting recipes using honey. Remember not to feed honey or anything containing honey to infants under 1 year old due to 'botulism'. 1. Spread diced cooked turkey in a shallow pan, season with salt and pepper. 2. Mix honey, prepared mustard, curry powder and turkey drippings. 3. Blend in turkey. Bake in moderate oven (180 degrees C) for about 30 minutes, stirring once or twice. Spoon over cooked rice. You can use chicken as well. Use as a marinade for uncooked chicken pieces (omit the turkey drippings). Chicken will require approximately 1 hour and 15 minutes to bake. 1. Pare oranges. Cut crosswise into thin slices and place in serving bowl. 2. Peel bananas and cut thin slices into the bowl with the oranges. 3. Toss fruits. Blend orange juice and honey and pour over fruits. 4. Sprinkle with coconut. Serve. 1. Combine butter, sugar and honey in large pan. Stir over low heat, without boiling until sugar is dissolved. Bring to boil. Remove from heat. 2. Add corn flakes to honey mixture. Stir gently to combine. 3. Spoon into patty cases in a muffin tray (or similar) and bake in moderate oven about 10 minutes. Melt butter in a saucepan. Add honey and lemon juice. Stir. Use it to glaze chicken after it has baked for 30 mins (or use a little on veggies).